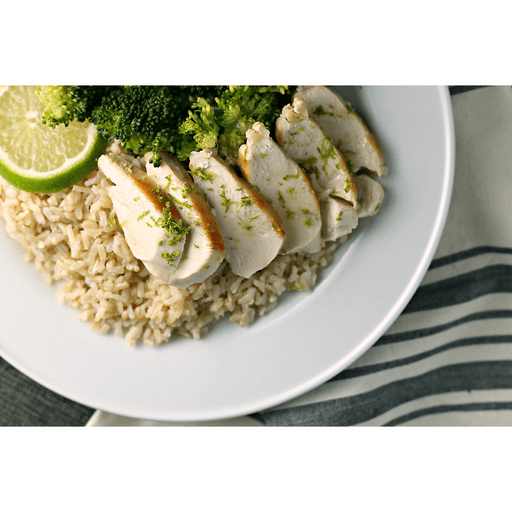 This Lime Chicken and Rice dish features a sweet and tangy, citrus sauce that adds a little pizzazz to tender, sliced chicken and nutty brown rice. 1. Cook brown rice according to package instructions. Set aside once cooked. 1. Preheat skillet coated with cooking spray over medium heat. Add chicken and cook 8-10 minutes, turning frequently until browned and cooked throughout. Remove cooked chicken from pan and set aside. 1. Whisk together cornstarch and apple juice until starch is dissolved. Pour into empty pan. Add lime juice and chicken stock. Cook over medium heat, stirring frequently, until sauce becomes thick and bubbly. Remove from heat and spoon sauce over cooked chicken. Garnish with lime zest and serve with cooked brown rice. Calories 330, Total Fat 5g (Saturated 1.5g, Trans 0g), Cholesterol 95mg, Sodium 110mg, Total Carbohydrate 30g (Dietary Fiber 2g, Sugars 5g), Protein 38g, Vitamin A 0%, Vitamin C 2%, Calcium 4%, Iron 10% *Nutritional values are an approximation. Actual nutritional values may vary due to preparation techniques, variations related to suppliers, regional and seasonal differences, or rounding.